Teradata customers want to maximize the value of all their data. They want to give more users access to more data, but they also need to keep confidential information safe—and concerns about data security shouldn’t keep them from leveraging the power and efficiency of the cloud. 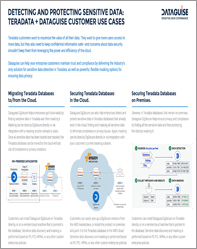 Dataguise can help your enterprise customers maintain trust and compliance by delivering the industry’s only solution for sensitive data detection in Teradata, as well as powerful, flexible masking options for ensuring data privacy.